A team of Michigan State University computer scientists led by Indian Institute of Technology (IIT) Kanpur alumnus Anil Jain has built the first three-dimensional (3-D) model of a human fingerprint. The development will not only help today’s fingerprint-matching technology do its job better, but could eventually lead to improvements in security. Imaging phantoms are common in the world of medical imaging. For example, to make sure an MRI machine or a CT scanner is working properly, it needs to first image an object of known dimensions and material properties. In this case, the ultimate goal is to have a precise fingerprint model with known properties and features that can be used to calibrate existing technology used to match fingerprints. Now, diabetes can be detected at an early stage by just taking a photograph of retina. An Indian company has developed a prototype of a portable device that enables diagnosis of the disease through retinal scan. Trivitron Health Care, a leading manufacturer of medical devices, has developed kiosk-type device in collaboration with Indian Institute of Technology, Madras (Chennai) and LV Prasad Eye Institute, Hyderabad. “The device will be available in the market in next six months after a patent is obtained,” Trivitron group of companies founder Dr G S K Velu told a reporter from DNA. “In a country like India which has second largest number of diabetics, the device can help in early detection and prevention,” said Dr Velu. Pune-based BioEnable Technologies has launched a scanner enBioScan-C1 that has been certfied by US Federal Bureau of Investigation (FBI) for Personal Identity Verficiation (PIV). 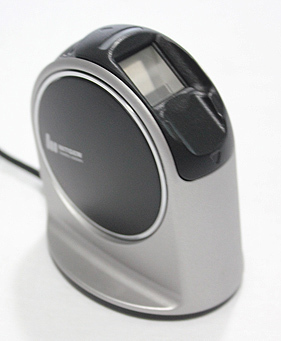 The scanner is flexible and user friendly in design. “It is a combination of high quality and cost effectiveness which will revolutionize the single finger scanner market,” says Pradeep Bhatia, managing director of BioEnable Technologies. Along with design customization feature, the device is capable of capturing extremely high quality images. It is expected to cater to the needs of the government or semi-government projects as it is both customizable and compatible withUnique Identification Authority of India’s Aadhaar authentication server. The scanner also complies with ISO standards such as ISO 19794, ISO 19792, NIST and ANSI, and “with world class algorithms and hardware, it outperforms FRR/FAR requirements set by STQC/ UIDAI,” says Bhatia. For technical specifications of the product, click here.